So… it’s GRIP week again. The Genealogical Research Institute of Pittsburgh (GRIP) has two sessions, one in June and, now, this week in July. Yeah, The Legal Genealogist is on the road again. Rick Sayre and I are co-coordinating the Law School for Genealogists course where a classroom full of eager students will hear about federal and state courts, resources like the U.S. Serial Set, tips for understanding records of our female ancestors, and so much more. Just what’s the difference, in a will, between the statement that something is bequeathed and the statement that something is devised? Why, Charmaine wanted to know, would there be a difference? Great question, because — even though today we basically use both words any time we give anything to anyone in a will and often say “I give, bequeath and devise” (just to cover all the bases) — historically, there really was a difference between the two terms. So the decedent in Charmaine’s case bequeathed his personal property, and he devised his real property — his land. After my Mother passed on, my Uncle (Mother’s brother got in to the act and sold the house. No-one can advise you about the legality of this sort of transaction except an attorney licensed to practice in the jurisdiction where the events occurred. You’ll need to hire a lawyer. Thank you. Of course it is too late to take any action. I was attempting to find out the true meaning of the difference between bequeath and devise. Anyway thank you very much for reply. 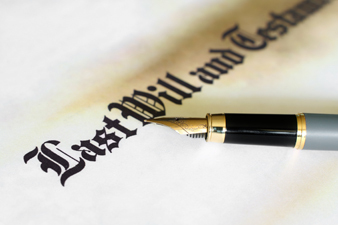 In modern wills, there is no difference. Thank you, but I just read on another site that there is a difference. Still need more research. If in my mother’s will she has devised and bequeathed to her children would this mean that we would nt have to sell the house to pay for her care in a home. I’m afraid that this is the kind of current-law question that should be answered by an attorney licensed to practice in your jurisdiction. Whatever the law meant years ago in terms of your genealogical research wouldn’t necessarily mean a thing when it comes to the law today. My mother wrote a letter that she had notarized bequeathing her car to her boyfriend’s son, and daughter-in-law under duress. Previously, she had a short will notarized by 2 notaries in her state, leaving all her worldly possessions to me, her daughter. The only worldly possessions she owns is her 2011 car. The last document she wrote was written in exactly the same wording, and she had it notarized. This time she left the car specifically to me. She no longer has any contact with her boyfriend, and hasn’t for almost a year now. She is concerned that the latest document might not hold up in court if her ex-boyfriend’s son should come after her for the car. Could his document hold up in court, even though she has since re-written a new bequeathment to me? You need to consult with an attorney licensed to practice in the jurisdiction where your mother lives to be certain what the formalities are that would make her bequest valid. In general (and keep in mind this is not legal advice), as long as the document is executed with all the formalities required by the law of her state, the last such document will be given effect. But it’s almost always better if that latest document specifically mentions that it is revoking any prior wills or bequests. Let me repeat, however, this is not legal advice and you should consult with an attorney licensed to practice in the jurisdiction where your mother lives.